For a while I have been using XAMPP as my goto quick and easy web server to temporarily serve files like ONTAP or SP firmware upgrades. Its easy to use and always works. Then there was Z-WAMP which was great because it was zero install. Again easy to use and always works. The problem was they also carried the extra baggage of PHP, MySQL, etc. All I needed was a simple http instance. And then I found HFS. It stands for HTTP File Server. Its simple, incredibly small, very portable, very easy to use and is a standalone executable. No installation. Just double-click hfs.exe and you are ready to go. HFS also works perfectly on Linux using wine 1.4 and later. Just don’t use the Wine Gecko option when prompted. On Linux, when you run >wine hfs.exe you will be prompted to download the Gecko option. Just click cancel to continue. From a NetApp perspective, its perfect for updating Data ONTAP and SP firmware over the network. Especially for shops that don’t run CIFS or NFS or where your Security overlords won’t allow you to NFS export and mount the root volume. I run HFS from my OnCommand Unified Manager server where I have all of my NetApp tools and utilities installed. 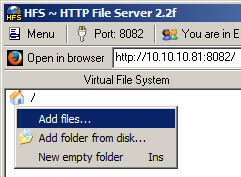 1) To start, double-click hfs.exe. a) Select No to add it to your right-click menu (unless you really want to). b) If you need to change the default port 80 perform this step. If not, skip it. In the upper left, click the Port: 80 button and change it to something like 8082. Click OK.
– Depending on how your NetApp applications are deployed, port 80 will probably be taken. A simple port change avoids conflicts. Don’t forget to create a firewall rule if you use a non-standard port. – If you are running this from a laptop or server without other apps using port 80, then its probably safe to leave on port 80. – If you want to click the “You Are in Easy Mode” button to change it to “Expert Mode,” you get additional transfer details. Its up to you. c) Copy the downloaded version of Data ONTAP you will be upgrading to onto the server where you are running HFS. d) In the HFS window on the upper left under the house/ icon, right-click and select Add files. e) Browse to the Data ONTAP file and select Open. It will now be listed under the home root /. Note that you can also drag and drop the file into this window. 2) On the NetApp controller, if not already done, create the software directory and then verify your version and backup kernel. 3) Download and install the Data ONTAP image from your HFS instance. Note the :8082 port definition in the URL below. If you changed it to something other than the default port 80, you must change it on the command line as well. If not, the default port 80 is correct. software: 5% file read from location.